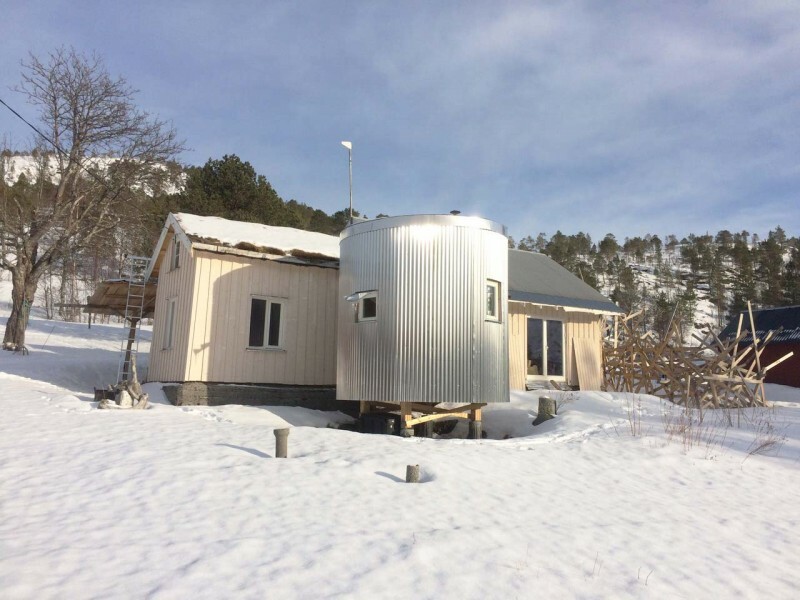 Successive DIY-alteration, upgrade and extension of a former farmstead on a Norwegian fjord, north of the Arctic Circle. Although built by students of an art class, the construction of planks on the right is not a piece of art by original semantic meaning. It got erected to keep the moose away. After the removal of the inner separating walls and the mounting of a bigger window towards the Fjord, the main building appears to be generous and offers a grandious view to the Husbyviktinden. 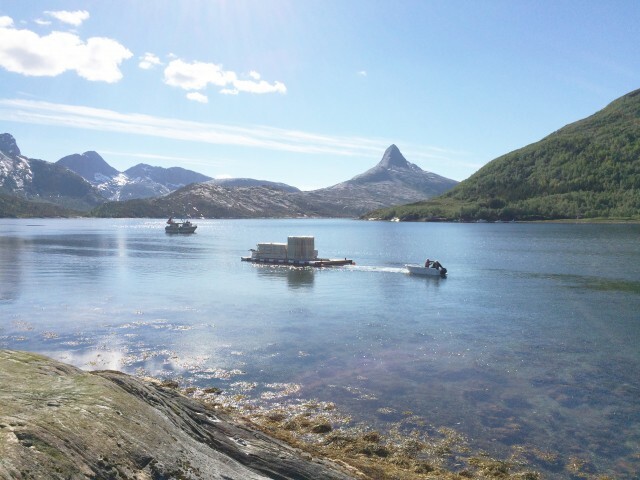 All building materials have to be shipped a roughly distance of 40 kilometers, cautiously loaded on a raft. As all the building materials have to be shipped over a distance of roughly 40 kilometers, the bill of materials becomes even more important. At Sagfjordbotn you do not just stop by at your local building materials trader if something hasn’t been thought of. 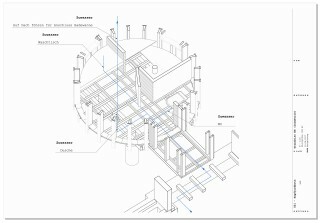 Drawing from the construction manual. Q: What do you want? 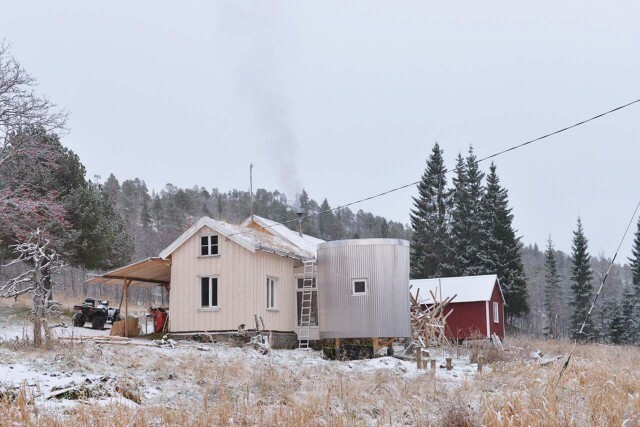 A: A bathroom, a sauna, a bathtub with a view. 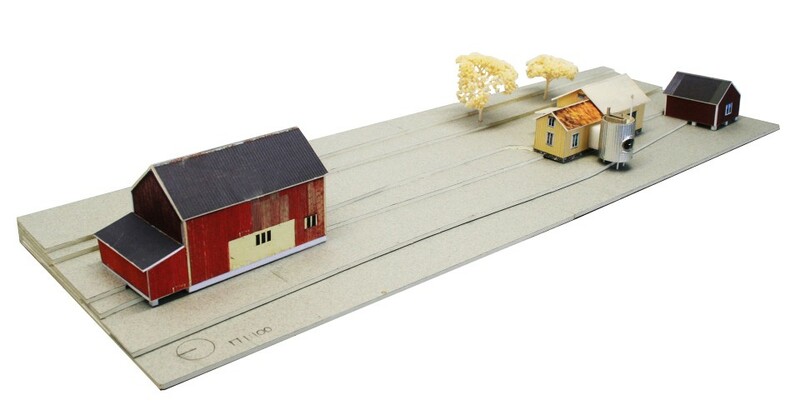 Model of the farmsteads buildings and the extension. 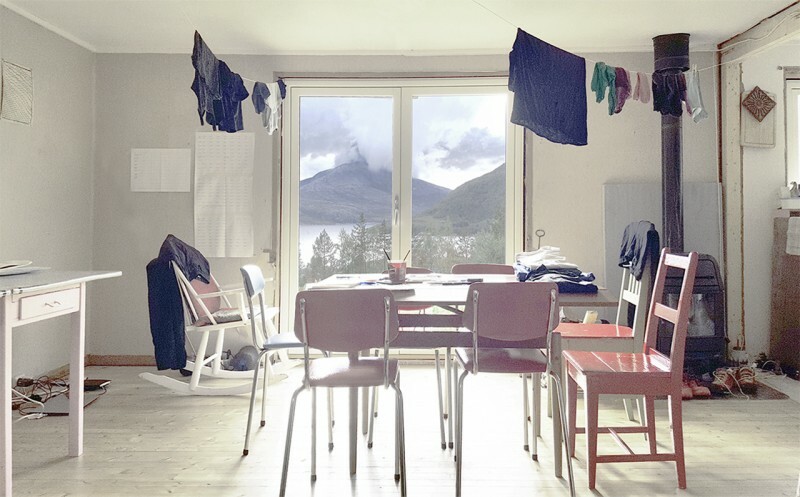 #sourceofinspiration: Charlotte Perriand & Pierre Jeanneret - "Tonneau refuge"
People living at the Sagfjordbotn wouldn't get along without the principle of sharing. Therefore the common is a widespread and natural concept that also includes all types of machines helpful when you are about to build something. Berlin to Sagfjordbotn is roughly a day trip: Berlin to Oslo by plane, Oslo to Bodø by plane, Bodø to Festvåg by bus, Festvåg to Kjerringøy on ferry, Kjerringøy to Tårnvika by bus, Tårnvika to Sagfjordbotn by boat. Waiting on the bus is potentially very, very thrilling. 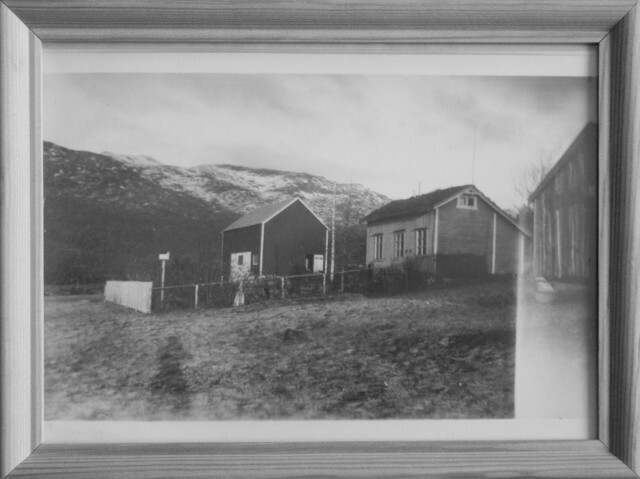 Historical photography of the farmstead as found there. The Sagfjord is a fjord arm north of the polar circle in the district of the municipality of Sørfold (1.600 km2 land, 2.000 inhabitants) in the province Nordland. The inner part of the fjord is named Sagfjordbotn. Here, above the hamlet Nattmålsodden, lies one of many abandoned farms: A small dwelling, a shed partially converted to live in, a barn with a workshop and a bit off a Utedass (outhouse). 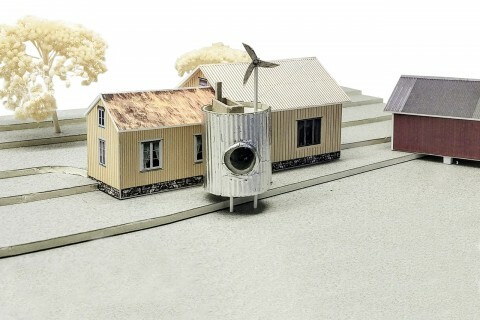 The dwelling was supposed to be used as a holiday house in the future, the rest of the buildings should step by step be transformed, so that they could host sleeping and studio space for workshops and seminar weeks with the art students of the clients. The farm is not accessible with cars or trucks. Any building material must be – according to its size – either be brought by boat or on self-constructed rafts. c/o now suggested to limit all renovation and extension works to the minimum. The spatial configuration of the dwelling was only changed by breaking off a wooden wall between the parlour and the kitchen. 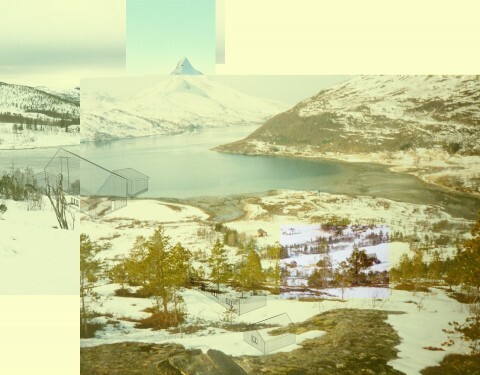 A window opening overlooking the fjord and oriented towards the prominent peak of Mount Husbyviktinden got enlarged and a double-wing door from the hardware store was inserted. The next branch of the Swedish hardware store chain ‘Biltema’ is located roughly 40 kilometres in a linear distance from the fjord, in between is the road from Fauske to Røsvik, from where then, as said before, every board and every screw must be shipped. For all building work, done by the clients together with befriended craftspeople and students, IKEA-style construction drawings were made by c/o now, that on the one hand explain all constructions stages in detail and on the other hand precisely define each board and screw in quality and quantity. If anything is forgotten at the hardware store, ‘a quick return to Biltema’ costs one workday. 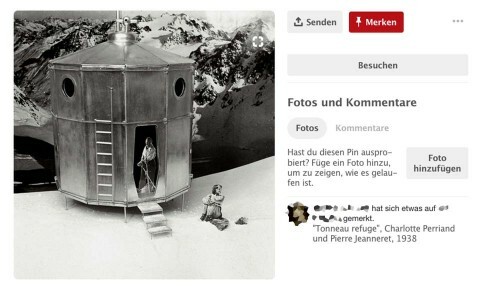 Such a planning was also done for the new bath-, sauna- and toilet house, that can be understood as homage to Charlotte Perriand’s & Pierre Jeanneret’s ‘Toneau refuge’ and to the pragmatic Scifi-Modernism of Polar Laboratory Architecture. 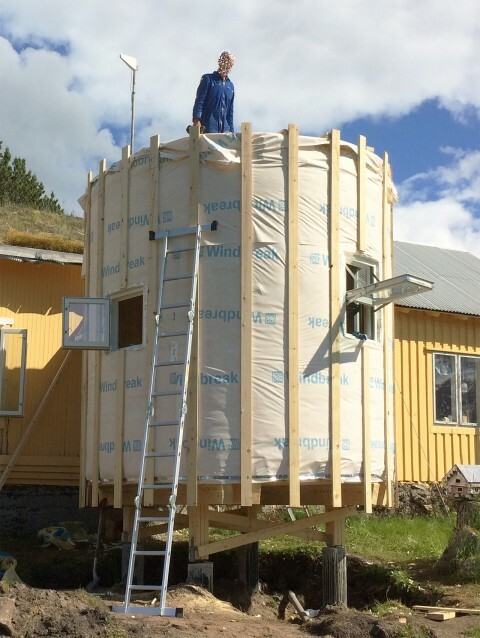 While beside new toilets in the adjoining buildings there is also the opportunity to use outside showers during the few warm weeks – although during that time the bathtub […] will be more likely to become a popular spot - the new bath-, sauna- and toilet house becomes a community space for most of the year. 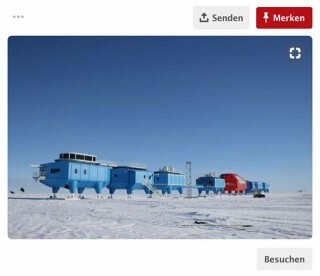 Not only is the planning procedure of The Can similar to the other construction works, but also all the building materials come from the exact same hardware store. Design decisions are therefore made in front of the good shelfs at Biltema: If portholes are not in stock, the windows simply become square. 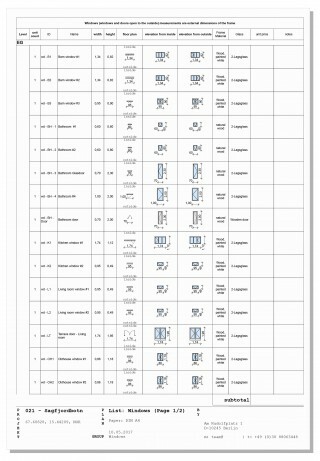 All screw counting is thereby no superstitious protection from higher powers. When the art students, after the first attack by the neighbouring elks, started to use the shipped building material to protect newly planted tree seedling and herbs, the construction site was on hold for days. What they intended to be a fence became a veritable sculpture that indeed was able to secure the plantation but also overtopped the ridge height of the dwelling. No material for the envelope of The Can and the dwelling was left. Back to the hardware store!